The introduction of the rigid ureteropyeloscope (Karl Storz GMBH) by Perez-Castro Ellendt and Martinez Pinero (Perez-Castro Ellendt and Martinez Pinero 1980) has lead to unprecedently rapid clinical and instrumental advances (Ford et al. 1984). There is little doubt that in 1987 no urologist can afford to be unfamiliar with this technique. 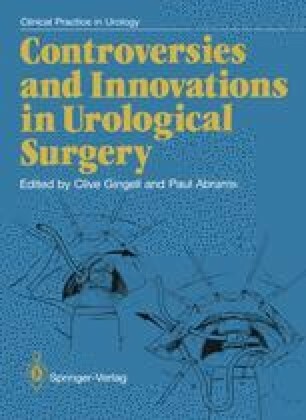 Concomitant advances in percutaneous nephrolithotomy (PCNL) (Miller 1985; Miller 1986) have complemented ureteroscopic techniques and should be considered as a single entity: upper tract endoscopy or “Endourology”, as the Americans have termed it. In this chapter the indications, techniques, complications, management of cases and instrumentation will be considered.